5 Palestinian civilians were killed and a girl child succumbed to her injuries in the West Bank and Gaza Strip. 96 Palestinian civilians, including 14 children and 5 journalists, were wounded in the West Bank and Gaza Strip. 5 Palestinian civilians were wounded in the southern Gaza Strip in 3 separate attacks. 107 Palestinian civilians, including 28 children, were arrested. 20 of them, including 14 children, were arrested in occupied Jerusalem. A number of houses belonging to families of Palestinians, who carried out stabbing and run-over attacks, were raided. Moreover, measures of the houses were taken for house demolitions. A house in al-Shaikh Jarrah neighbourhood was demolished and demolition notices were issued. 30 dunums in the northern West Bank were confiscated. 8 Palestinian civilians, including a child and 4 brothers, were arrested at military checkpoints. A Palestinian civilian was arrested at Beit Hanoun “Erez” crossing, north of the Gaza Strip. Israeli violations of international law and international humanitarian law in theoPt continued during the reporting period (10 – 16December 2015). Israeli forces have continued to commit crimes, inflicting civilian casualties. They have also continued to use excessive force against Palestinian civilians participating in peaceful protests in the West Bank and Gaza Strip, the majority of whom were youngsters. Occupied East Jerusalem witnessed similar attacks. During the reporting period, Israeli forces killed 5 Palestinian civilians, while a child girl succumbed to her wounds. Moreover, 101 Palestinian civilians, including 14 children and 5 journalists, were wounded. Thirty-nine of whom, including 5 children, were wounded in the Gaza Strip and the others were wounded in the West Bank. Concerning the nature of injuries, 84 civilians were hit with live bullets, 11 ones were hit with rubber bullets and 6 others were hit with shrapnel and tear gas canisters. On 11 December 2015, Israeli soldiers stationed at a checkpoint established at a checkpoint stationed at a checkpoint established 20 days ago on Sa’ir Main Road, east of Hebron, killed ‘Issa Hroub (56) from Deir Samit village, southwest of Hebron. The aforementioned civilian was killed when Israeli forces opened fire at his car. The aforementioned was on his way back from al-Shyoukh village via Sa’ir road. The Israeli soldiers claimed that Hroub intended to carry out a run over attack. On the same day, Israeli forced opened fire at ‘Oday Irshayed (24) from al-Salam Street in Hebron. As a result, he was hit with two bullets from to his chest and neck. The aforementioned civilian was participating in a protest following the Friday Prayers in Ras al-Jorah Intersection, north of the city. It should be mentioned that ‘Oday is the brother of Dania Irshayed (16), who was killed by Israeli soldiers at the entrance of al-Ibrahimi Mosque on 25 October 2015 under the pretext of attempting to carry out a stab attack. In two separate incidents, Israeli forces killed two Palestinian civilians during a predawn military incursion into Qalandia refugee camp, north of Jerusalem, under the pretext of carrying out two run over attacks against Israeli soldiers, who raided and searched shops and houses. On the same day, medical sources declared that Samah ‘Abdel Mo’men ‘Abdullah (18) from ‘;Amoriah village, southeast of Nablus, succumbed to her wounds. The aforementioned girl was wounded on 23 November 2015 when Israeli soldiers stationed at Howarah checkpoint, south of Nablus shot dead ‘Alaa’ Hashah (16) from ‘Askar al-Jadid refugee camp, northeast of the city. Meanwhile, she was hit with a bullet to the head and taken to Bensolon Hospital in Israel. She stayed there until her death was declared. During this week, 62 Palestinians, including 9 children and 4 journalists, were wounded. In peaceful protests against Israeli policies: 39 Palestinian civilians, including 5 children and 3 journalists, were wounded. Thirty-one of them were hit with live bullets; and the eight others were hit with rubber-coated metal bullets. In peaceful protests against Israeli incursion: 12 Palestinian civilians, including a child, were wounded with live bullets. At the checkpoints and public roads:2 Palestinian civilians, including a child, were hit with live bullets. In peaceful protests against the annexation wall and settlement activities: nine Palestinian civilians, including 2 children and a photojournalist, were wounded. Six of whom were hit with live bullets; two civilians with rubber-coated metal bullets and one with a sponge-tipped bullet. In the Gaza Strip, Israeli forces wounded 39 civilians, including 5 children and a journalist. Thirty-three of them were hit with live bullets, one with rubber-coated metal bullets, and 5 with shrapnel and tear gas canisters. Thirty-four of them were wounded during protests. Meanwhile, the five others were wounded during shooting incidents in the border areas in the southern Gaza Strip. On 11 December 2015, in excessive use of force, Israeli forces shot dead Sami Madi (4!) from Deir al-Balah in the central Gaza Strip when he was participating in a protest organized by hundreds of Palestinian civilians adjacent to the border fence between the Gaza Strip and Israel, east of al-Bureij in the central Gaza Strip. As a result, he was hit with a bullet to the chest. 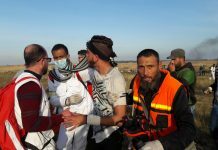 North of the Gaza Strip: 12 Palestinian civilians, including 2 children, were wounded; 8 of whom sustained a live bullet wound, one was hit with rubber-coated bullets, and the 3 others were hit with tear gas canisters. Central Gaza Strip: 16 Palestinian civilians, including 2 children and a journalist, were wounded with live bullets. In the context of shooting incidents at the border area, on 11 December 2015, Israeli forces stationed along the border fence between the Gaza Strip and Israel, east of Jabalia in the northern Gaza Strip opened fire at the border area. The shooting caused fear among farmers and bird hunters who were forced to flee from the area for fear of being wounded. No causalities were reported. On 13 December 2015, Israeli forces stationed along the border fence between the Gaza Strip and Israel, east of Rafah in the southern Gaza Strip opened fire at shepherd Bashir Sabah (21), southeast of al-Shokah village. As a result, he was hit with bullet to the right knee. On 16 December 2015, Israeli forces stationed at the border fence between the Gaza Strip and Israel, east of al-Fokhari area, east of Khan Yunis, south of the Gaza Strip, opened fire at the border area. As a result, Yusef Mohammed Abu Aqel (20) was hit with a bullet that penetrated the belly and entered the hand. The aforementioned person was grazing his sheep near a landfill that is about 150 meters away from the border fence. On the same day, Israeli forces stationed at the border fence between the Gaza Strip and Israel, east of Khan Yunis, south of the Gaza Strip, fired a number of shells at lands and areas to the west of the border fence following the explosion of an explosive device, east of al-Qararah village. As a result, 2 civilians were wounded; wounds of one of whom were classified as serious. As part of Israeli airstrikes on the Gaza Strip, on 14 December 2015, Israeli warplanes targeted a military training site belonging to al-Qassam Brigades (the armed wing of Hamas movement), southwest of Beit Lahia, north of the Gaza Strip. The site sustained serious material damage, but no casualties were reported. The explosion rocked the area, due to which, residents of that area were frightened. As part of targeting Palestinian fishermen, on 10 December 2015, Israeli gunboats stationed off al-Waha shore, northwest of Beit Lahia, and off al-Sudaniyah shore, west of Jabalia, north of the Gaza Strip, opened fire in the civinty Palestinian fishing boats sailing within 3 nautical miles. The shooting repeated on 13 December 2015, but no causalities were reported. During the reporting period,Israeli forces conducted at least 106 military incursions into Palestinian communities in the West Bank and 7 ones in occupied East Jerusalem.During these incursions, Israeli forces arrested at least 107 Palestinian civilians, including 28children and two women. Twenty of these civilians, including 14 children, were arrested in East Jerusalem. During the reporting period, Israeli forces raided two offices belonging to the Popular Front for the Liberation of Palestine (PFLP) in Jenin and Tulkarm and confiscated the contents in addition to the office of Cultural Enlightenment Forum in Nablus and a Laboratories’ Equipment Company in the center of Ramallah. Israeli forces also raided and searched houses belonging to families of Palestinians accused of carrying out run over and stab attacks against settlers and soldiers. They also threatened the families that they will demolish their houses. On 13 December 2015, the Israeli Collection Department issued a notice to evacuate two residential buildings in “Batn al-Hawa” neighbourhood in Silwan village, south of East Jerusalem after the settlement organization “’Ateerat Cohanim” obtained it under the pretext of “settlers’ ownership of the land”. According to PCHR’s investigation, the Israeli authorities handed an evacuation order to Yousef Basbous and his sons that was issued by the Israeli Collection Department in favour of the settlement organization “Ateerat Cohanim” claiming that the land is owned by settlers since the year 1881; they also imposed large sums of money on the family as “compensation for lawyers”. On 15 December 2015, joint staffs from the Israeli Municipality and forces raided a building belonging to the family of Khail ‘Alian in Jabal al-Mukkaber village, southeast of East Jerusalem, and handed the family an administrative demolition under the pretext of building without a license. ‘Alian family said that the building belonging to Khalil ‘Alian and his sons is comprised of 3 floors; in each of which there is a 130-square-meter apartment. The building shelters 25 members. 16 December 2015, Israeli musicality bulldozers demolished a house belonging to Ibrahim Diab in al-sheikh Jarrah neighborhood, north of East Jerusalem’s old City under the pretext of building without a license. The house used to shelter a family of 7 members, including 5 children and was build years ago. The family rebuilt parts of the 85-square-meter house. On 12 December 2015, activists from Peace Now organization revealed that the Israeli Civil Administration issued a military order, which declared about 30 dunums of Palestinian lands in Deiristiya village in Salfit and Jinsafut village in Qalqiliya, as “State Land”. The dunums to be confiscated are located between the settlements of “Karne Shamron” and “Ma’ale Shamron” established on the lands of the aforementioned villages. On 10 December 2015, a group of settlers under the Israeli forces’ protection backed by military vehicles moved into “al-Hafirah” area between ‘Arabah and Markah villages, southwest of Jenin. On 13 December 2015, a group of settlers moved into the area of “Tarsalah settlement”, which was evacuated in 2005, and also known as “Sanour Camp” established on Palestinian lands, south of Jenin. The settlers set their tents and stayed for some time in the area to perform Talmudic prayers. The settlers later withdrew as Israeli soldiers arrived at the area. No further incidents were reported. On 12 December 2015, activists from Peace Now organization revealed that the Israeli Civil Administration issued a military order, which declared about 30 dunums of Palestinian lands in Deiristiya village in Salfit and Jinsafut village in Qalqiliya, as “State Land”. On 10 December 2015, a group of settlers under the Israeli forces’ protection backed by military vehicles moved into “al-Hafirah” area between ‘Arabah and Markah villages, southwest of Jenin. They performed religious rituals near an archaeological site. Meanwhile, Israeli forces raided and searched a house belonging to Samer Mohammed Ahmed Mousa (46) and turned it into a military observation point. Mohammed Sami Abdul Rahim Akhras (23). At approximately 01:30, Israeli forces moved intoal-Samou’ village, south of Hebron. They raided and searched a house belonging to the family of Jamal Mousa Abu al-Jadayel (62). They then arrested his son Emad and took him to an unknown destination. Around the same time, Israeli forces moved into Khellet Khadour, south of Hebron. They raided and searched ahouse belonging to the family of Saleh Khalil al-Rajabi (30). Moreover, they arrested the aforementioned person and took him to an unknown destination. At approximately 02:00, Israeli forces moved into Jabal al-Sharif area, south of Hebron. They raided a house belonging to the family of Fathi Maswadi, whose son Ehab was killed by Israeli forcesnear the “Mafia” checkpoint, south of the Ibrahimi Mosque on 07 December 2015, following a stabbing. Israeli forces kept the family outdoorsand searched the house. Israeli intelligence officers threatened to demolish the house, but no arrests were reported. Around the same time, Israeli forces moved into al-Rahma square, south of Hebron. They raided 2 houses belonging to the families of Mostafa Fadel Abdul Men’em Fanoun (16) and Faisal Abdul Men’em Fanoun (20), who were killed by Israeli forces in Tal al-Rumaida neighbourhood, on 04 December 2015, under the pretext of a stabbing. Israeli forces kept the families outdoors and searched the houses, while an explosives’ unit took measures of the 2 houses. Israeli intelligence officers threatened to demolish the 2 houses, but no arrests were reported. Also around the same time, Israeli forces moved into Nablus. They raided the Cultural Enlightenment Forum on the third floor of al-Masri building in the centre of the city. They searched the Forum’s office and confiscated some files and hard discs of 9 PCs. Moreover, they damaged all furniture and content of the office. At approximately 02:30, Israeli forces moved into Yatta town, south of Hebron. They raided and searched a house belonging to the family of Obaidah Mohammed (20). They then arrested the aforementioned person and took him to an unknown destination. At approximately 03:30, Israeli forces moved into al-Aroub refugee camp, north of Hebron. They raided and searched a house belonging to the family of Ahmed Ibrahim al-Badawi (21). They then arrested the aforementioned person and took him to an unknown destination. At approximately 07:00, Israeli gunboats stationed off al-Waha shore, northwest of Beit Lahia, north of the Gaza Strip, opened fire around Palestinian fishing boats sailing within 3 nautical miles.The gunfire lasted for 20 minutes, but neither casualties nor material damage were reported. At approximately 16:30, Israeli forces moved into the western Laban village, northwest of Ramallah. They raided a number of stores and confiscated the surveillance cameras’ devices. Israeli forces then withdrew and no further incidents were reported. Note: During the aforementioned day, Israeli forces carried out 8incursions in the following areas without reporting any arrests: Halhoul; al-Fawar refugee camp, Bani Na’im village, Tafouh village, Beit Oula village, Sekka village, al-Moreq village and Emrish village in Hebron. At approximately 00:00, Israeli forces moved into the western Laban village, northwest of Ramallah.They raided using sniffer dogs a house belonging to the family of Mohammed Abdul Halim Abdul Hamid Salem (37) after damaging the main door with a sharp tool. Israeli soldiers arrested the aforementioned person and took him to an unknown destination. They claimed that Salem run over a number of soldiers on 10 December 2015, near the village’s eastern entrance. At approximately 02:00, Israeli forces moved into Jenin and stationed in al-Marah neighbourhood, southeast of city. They raided a 3-storey building belonging to al-Zughaibi family. They raided the last floor belonging to Selah Khalil Abdullah al-Zughaibi (53), a leader in the Popular Front for the Liberation of Palestine (PFLP). They arrested Selah and then raided a nearby house belonging to the family of Abdullah Afif Abdullah Zakarnah (51), a PFLP leader also and an officer at Jenin’s Municipality. Israeli soldiers arrested him as well. They then raided a house belonging to the family of Jom’ah Bassam Jom’ah Ba’jawi (30), a PFLP member, and arrested him. In the meantime, Israeli forces raided the PFLP office in al-Basateen area in the centre of the city, after blowing up the door. They confiscated some of its contents and damaged others. After which, they withdrew to al-Zahrah neighbourhood, west of the city, and raided a house belonging to the family of Abdul Halim Nayef Khalil Ezz al-Din (48). They also arrested him. Fawzi Samir Sa’d Zbaidi (26). Around the same time, Israeli forces moved into Ramallah. They stationed on al-Zahrah Street near al-Manarah Square in the city and then raided a Laboratories’ Equipment Company. They opened the door with a sharp tool and then searched the company. In the meantime, a number of Palestinian youngsters threw stones and empty bottles at Israeli vehicles. Israeli soldiers chased them in the streets while firing sound bombs, tear gas canisters and rubber-coated metal bullets. As a result, 2 civilians, including a child, were wounded. They were then taken to Palestine Medical Complex to receive the necessary medical treatment. At approximately 05:00, Israeli forces confiscated the surveillance cameras’ videos and a hard disc from the company. At approximately 06:00, Israeli forces moved into Shofa village, southeast of Tulkarm. They raided and searched a house belonging to the family of Badran Abdullah Saleh (44). Moreover, they arrested the aforementioned person and took him to an unknown destination. At approximately 10:00, Israeli forces moved into Tulkarm. They raided and searched a PFLP office, opposite the al-Quds Bank, in the centre of the city. In addition, they confiscated some contents and damaged others. At approximately 10:20, Israeli forces stationed along the border fence between the Gaza Strip and Israel, east of al-Shuhada cemetery, east of Jabalia, north of the Gaza Strip, opened fire at the border area. The farmers, who were on their lands near the border area, and bird hunters were frightened as a result and fled fearing for their lives. No casualties were reported. At approximately 11:30, Israeli forces stationed at al-Jalamah crossing between Jenin and Israel, northeast of Jenin, opened fire at a Palestinian civilians, who was present around the crossing. He sustained a bullet 3 bullet wounds. The bullets penetrated his belly and leg. Israeli forces claimed that the wounded person had opened fire towards the crossing, but they could not arrest him because a Palestinian minibus approached and pulled him inside heading to Jenin. At approximately 12:30, in excessive use of deadly force, Israeli forces stationed at the military checkpoint established since 20 days on the main road in Sa’ir village, east of Hebron, killed Essa Ibrahim Salamah Hroub (56), from Deir Samet village, southwest of Doura, southwest of Hebron. The aforementioned person was killed after Israeli soldiers opened fire at the vehicle he was driving while going back from al-Shyoukh village. Israeli forces claimed that Hroub was attempting to run over them. After pulling him out of his vehicle that was confiscated, Israeli soldiers left him bleeding without offering himfirst aid. He was then transported by a Red Star of David’s ambulance to an unknown destination. According to inspections at the checkpoint, Israeli forces had placed cement cubes on sides of the road behind which Israeli soldiers were hiding. No vehicle can run over the soldiers because the cement cubes are protecting the soldiers. It should be noted that the killed person had 2 wives and 16 children, 8 of whom are below 18. He used to be a trader moving throughout Jerusalem. At approximately 17:15, Israeli forces moved into Qalqilya. They raided and searched a number of houses from which they arrested 2 civilians, including a child. The arrested were identified as Zeyad Nasser Nofal (17) and Malek Saleh al-Aqra’ (18). Note: During the aforementioned day, Israeli forces carried out 7 incursions in the following areas without reporting any arrests: al-Aroub refugee camp, Tafouh village, Sa’ir village, al-Shyoukh village, Deir al-Asal al-Fouqa village, and Tarousah village in Hebron. At approximately 01:30, Israeli forces moved into the western Laban village, northwest of Ramallah. They raided and searched a house belonging to the family of Mohammed Abdul Halim Salem (37), who was arrested the previous day. They kept the family, including 6 children, in one room for an hour. They then kept them on the roof of the house for another hour although it was too cold. After which, an explosives team took the measures of the house and withdrew later. Around the same time, Israeli forces moved into Surif village, west of Hebron. They stationed in the eastern side of the village and then raided a house belonging to the family of Wa’d Arafat al-Hadmi (23). Moreover, they handed over to the aforementioned person a summons to refer to the Israeli intelligence service at “Gosh Etzion” settlement, south of Bethlehem. They also handed over to Rami Ibrahim Hadoush (32) a similar summons. At approximately 02:30, Israeli forces moved into Aboud village, northwest of Ramallah. They then raided and searched a house belonging to the family of Salem Samih Khalil (29). Moreover, they arrested the aforementioned person and took him to an unknown destination. At approximately 03:30, Israeli forces moved into Tulkarm and Tulkarm refugee camp, adjacent to the city. They then raided and searched a number of houses from which 6 civilians were arrested. The arrested persons were identified as Hamzah Shawqi Mohammed Yusef (22), Rami Khalil Khader Hamshari (36), Ahmed Adel Mahmoud Shalabi (28), Abdul Hamid Mohammed Abdul Hamid Bani Ouda (26), Lo’ai Samir Sa’id Abu Haneyah (30) and Yehya Amjad Baker Yehya (22). Around the same time, Israeli forces moved into Ramallah. They stationed on al-Zahra Street near al-Manarah Square in the centre of the city and then raided for the second time in 24 hours the Laboratories’ Equipment Company. They also opened the door with a sharp tooland searched the company. In the meantime, a number of youngsters gathered and threw stones and empty bottles. Israeli soldier chased them while firing sound bombs and tear gas canisters. As a result, a number of demonstrators suffered tear gas inhalation. Israeli forces withdrew later and no arrests were reported. Also around the same time, Israeli forces moved into Ras al-Jorah, north of Hebron. They stationed near Zaid gas station. After which, they raided and searched a house belonging to the family of Belal Jamal Awad al-Fakhouri (22) and handed over to him a summons to refer to the Israeli intelligence service at “Gosh Etzion”, south of Bethlehem. At approximately 04:00, Israeli forces moved into Safareen village, southeast of Tulkarm. They raided and searched a house belonging to the family of Sameh Abdul Latif Salem. After which, they arrested his 2 sons Rami (21) and Mohammed (22). Around the same time, Israeli forces moved into Bethlehem. They raided al-Sadaqah dispensary in the centre of the city. They damaged its doors and confiscated 3 PCs, a number of administrative and medical files and cheques. Dr. Nedal Salamah, the Medical Manager at the dispensary, said to PCHR’s fieldworker that Israeli forces had raided the dispensary and confiscated PCs and files. As a result, the health services stopped. It should be noted that Israeli forces raided the same dispensary several times in 2014 and confiscated some items from it. Note: During the aforementioned day, Israeli forces carried out 8incursions in the following areas without reporting any arrests: Qalqilya; al-Khader village, south of Bethlehem; Halhoul; al-Fawwar refugee camp; al-Samou’ and Kharas villages and al-Hadab and Karza villages. At approximately 00:30, Israeli forces moved into Qabatya village, southeast of Jenin. They raided and searched 2 houses belonging to the families of Nasser Mohammed Sadeq Abu Zaid (24) and Mohammed Ahmed Abu Zaid (25). Israeli forces handed summonses over to the two aforementioned persons to refer to the Israeli intelligence service at Salem detention facility, northwest of the city. At approximately 01:30, Israeli forces moved into Silwad village, northeast of Ramallah. They raided and searched 3 houses. They handed summonses over to Maher Nader Hamed (27) and his brother Akram (21) and Emad Essa Hammad (22), to refer to the Israeli intelligence service at Ofer detention facility, southwest of Ramallah. Israeli forces withdrew later and no arrests were reported. It should be noted that Maher was arrested during the interview. Around the same time, Israeli forces moved into Yatta, south of Hebron. They stationed in al-Karmel area and raided a house belonging to the family of Ashraf Samir Abu Ali (35). They handed him over a summons to refer to the Israeli intelligence service at “Gosh Etzion” settlement, south of Bethlehem. At approximately 02:00, Israeli forces moved into Tulkarm and stationed in the southern neighbourhood. Moreover, they raided a car workshop belonging to Sa’id Ghazi Sa’id Qatawi (42) after destroying the door. They searched the workshop and confiscated the DVR in the workshop. After which, Israeli forces raided and searched a gas station on the main road between Tulkarm and Bal’a village, east of Tulkarm. At approximately 02:30, Israeli forces moved into al-Aroub refugee camp, north of Hebron. They stationed near the UNRWA Distribution Centre. They raided and searched a house belonging to the family of Wadee’ Abed al-Qassas (17). After which, they arrested the aforementioned person and took him to an unknown destination. At approximately 03:30, Israeli forces moved into al-Baldah suburb, southwest of Hebron. They raided and searched a house belonging to the family of Mo’taz Diab Refa’iyah (23). Israeli soldiers handed him over a summons to refer to the Israeli ntelligence service at “Gosh Etzio” settlement, south of Bethlehem. Around the same time, Israeli forces moved into Tawoos village, southwest of Doura, southwestof Hebron. They stationed near the village’s mosque. After which, they raided and searched a house belonging to the family of Abdul Rahman Mohammed Abu ‘Arqoub (24). The aforementioned person was arrested and then taken to an unknown destination. At approximately 08:00, Israeli gunboats stationed off al-Waha shore, northwest of Beit Lahia, northwest of Beit Lahia village, north of the Gaza Strip, opened fire around Palestinian fishing boats sailing within 3 nautical miles. The gunfire continued for 20 minutes. As a result, the fishermen were frightened and sailed back fearing for their lives. Neither casualties nor material damage were reported. At approximately 15:00, Israeli forces opened fire at Lama Monther Hafez al-Bakri (16), from Abu al-Ghrous area, east of Hebron. As a result, she sustained several bullet wounds to the legs. The aforementioned girl was wounded 20 meters away from the military checkpoint that was established on the road leading to “Kiryat Arba” settlement, east of the city. The wounded girl was transported by a Red Star of David’s ambulance to an Israeli hospital after she was left bleeding for over half an hour. Israeli forces claimed that al-Bakri attempted to carry out a stabbing, therefore, they opened fire at her. At approximately 15:40, Israeli forces stationed at the border fence between the Gaza Strip and Israel, east of Rafah, south of the Gaza Strip, opened fire at the shepherdBashir Hassan Hussein Sabbah (21), who was present to the southeast of al-Shouka village. As a result, he sustained a bullet wound to the right knee. He was then taken to Abu Yusef al-Najjar Hospital in Rafah. His wound was classified as moderate. In the evening, Israeli forces arrested Abdul Karim Zeyad Abdul Karim al-Hamshari (26), from Tulkarm, while he was present at the Israeli military Liaison officer, southwest of the city, upon a summons delivered to previously. Note: During the aforementioned day, Israeli forces carried out7 incursions in the following areas without reporting any arrests: Halhoul town; al-Shyoukh village; al-Zaitoun suburb; al-Hariya valley; al-Burj village; al-Majd village and Beer al-Basha village, south of Jenin. At approximately 00:20, Israeli warplanes launched a missile at a training site of al-Qassam Brigades (the armed wing of Hamas movement), southwest of Beit Lahia, north of the Gaza Strip. The site sustained serious material damage, but no casualties were reported. The explosion rocked the area, due to which, residents of that area were frightened. At approximately 01:00, Israeli forces moved into Beit Awwa village, southwest of Doura, southwest of Hebron. They stationed in the centre of the village, and then raided and searched a number of houses from which they arrested: Ismail Abdul Qader Shalash (17), Wa’el Hussein Abdul Nabi Masalmah (35) and Ahmed al-Sweiti (28). At approximately 01:30, Israeli forces moved into Deir Qeddis village, west of Ramallah. They raided 3 houses and delivered 3 summonses to 3 persons to refer to the Israeli intelligence service at Ofer detention facility. The summoned persons were identified as Hazem Daher Hassan Naser (16), Hazem Ahmed Mahmoud Hamadah (18) and Mohammed Ismail Yassin Awad (19). At approximately 02:00, Israeli forces moved into Qaryout village, southeast of Nablus. They raided and searched a number of houses from which they arrested 8 civilians, including 5 children. The arrested children were identified as Mesleh Ahmed Badawi (65) and his son Mo’tasem (14), Mohammed Majli Essa (45) and his son Islam (16), Abed Anwar Azem (22), Tawfiq Khaldoun Azem (15), Mohanned Hesham Mousa (16) and Qased Mohammed Mousa (15). Around the same time, Israeli forces moved into al-Salam Street area in the centre of Hebron. They raided and searched 2 houses from which they arrested Haifa Makroum Abu Ermaila (37) and Haitham Essam Mohammed al-Jo’bah (23). At approximately 03:00, Israeli forces moved into al-Aroub refugee camp, north of Hebron. They stationed near the UNRWA Distribution Centre. After which, they raided and searched a number of houses from which they arrested Haitham Yusef Abu Ghazi (17), Sa’ed Ibrahim al-Badawi (24) and Emad Zuhair Abu Wardah (23). At approximately 07:00, Israeli forces moved into Tulkarm. They raided a toys’ factory belonging to Rasem Ibrahim Ahmed Hussein (49). They confiscated some toys and fabrics and damaged a number of machines. Israeli forces then headed towards Tulkarm police station, east of the city, and checked some vehicles seized by the Palestinian police for being stolen. Note: During the aforementioned day, Israeli forces carried out8incursions in the following areas without reporting any arrests: Nablus; Halhoul town; Bani Na’im village, al-Shyoukh village, Beit Ommer village, al-Moreq village and al-Fahs area in Hebron; and Arrabah village, southwest of Jenin. At approximately 01:00, Israeli forces moved into the south of Hebron. They raided and searched 2 houses from which they arrested Mohammed Rawhi Abu Shmaisah (20) and Karam Saleh Shaheen (18). Around the same time, Israeli forces moved into al-Ghrouz valley, east of Hebron. They raided and searched a house belonging to Monther Hafez al-Bakri (45). An explosives’ team took the measures and photos of the house claiming that his daughter Lama (16), who was wounded and arrested by Israeli forces on 13 December 2015, attempted to carry out a stabbing. At approximately 02:00, Israeli forces moved into Beit Ommer village, north of Hebron. They raided and searched a house belonging to the family of Yusef Mesleh Awad. They arrested his son Mohammed and took him to an unknown destination. Around the same time, Israeli forces moved into Tulkarm. They raided and searched a number of houses from which they arrested the former prisoner Hamzah Mohammed Mostafa Salamah “al-Safi” (24), Baha’ Mohammed Abdul Ra’ouf Jayousi (18) and the former prisoner Zahi Yasser Abdul Razeq Oufi (30). At approximately 20:30, Israeli forces moved into Silwad village, northeast of Ramallah. They raided and searched a number of houses from which they arrested Othman Amin Seraj (26), Mohammed Ahmed Seraj (23), Mohammed Abul Majid Hammad (31) and Bassam Abdul Rahim Hammad (43). The last arrested civilian is a former prisoner and the father of Anas, who was killed by Israeli forces 2 weeks ago after running over Israeli soldiers at the western entrance of the village. Around the same time, Israeli forces moved into Birzait village, north of Ramallah. They raided and searched the Birzait University student accommodation. After which, they arrested 4 university students from the Islamic Bloc. The arrested students, who were taken to an unknown destination, were identified as Ehab Marwan Nasser (22), from Deir Qeddis village, west of the city; Msallam Barghouthi (22), from Deir Ghassanah village, northwest of the city; Ibrahim Jack (23), from al-Bireh city; and Saif al-Eslam Dughlus (24), from Barqah village, northwest of Nablus. At approximately 03:00, Israeli forces moved into Kufor Ne’mah village, west of Ramallah. They raided and searched a house belonging to the family of Mohammed MEdhat Abdu (22). Moreover, they arrested the aforementioned person and took him to an unknown destination. Around the same time, Israeli forces raided and searched a house belonging to the family of Taher Allan in Beit Jala. They arrested his son Ali (20) and took him to an unknown destination. At approximately 04:00, Israeli forces moved into al-Samou’ village, south of Hebron. They stationed in al-Simya area and then raided a house belonging to the family of Yusef Mesleh Awad (40). They arrested the aforementioned person and took him to an unknown destination. At approximately 09:00, Israeli forces moved into Anzah village, south of Jenin. A number of youngsters gathered and threw stones and empty bottles at Israeli soldiers that fired sound bombs and tear gas canisters in response. Israeli soldiers arrested Tareq Zeyad Atta Atayani (17) and Sami Rabee’ Atta Atiyan (18). However, they were released following the intervention of the Palestinian military liaison. Note: During the aforementioned day, Israeli forces carried out7incursions in the following areas without reporting any arrests: Qalqilya; Jayous village, northeast of the city; Surif village, al-Daheriya village, al-Fawwar refugee camp, al-Hadab village and Tawoos village in Hebron. At approximately 01:00, Israeli forces moved into al-Dheisha refugee camp, southwest of Bethlehem. They raided and searched a number of houses, whereas a number of youngsters gathered and threw stones and empty bottles at them. Israeli soldiers fired sound bombs, rubber-coated metal bullets and sound bombs in response. As a result, 10 civilians were wounded. Three of whom sustained live bullet wounds and the 7 others sustained rubber bullet wounds according to the Palestine Red Crescent Society (PRCS). The wounded were taken to Beit Jala Hospital to receive the necessary medical treatment. Their injuries ranged between moderate and serious. Before withdrawal, Israeli forces arrested 5 civilians, who were identified as Yazan al-Ju’aidi (18), Hamdi (24) and Mohammed Ma’rouf al-Atrash (22), Emad Mohammed Shamroukh (22) and Ahmed Khalil al-Ja’fari (21). Around the same time, Israeli forces moved into Askar refugee camp, northeast of Nablus. They raided and searched a number of houses. They then arrested Ahmed Sa’di al-Nadi (24) and took him to an unknown destination. Also around the same time, Israeli forces moved into Beita village, south of Nablus. They raided and searched a number of houses. They then arrested Ahmed Jehad Shaltaf (22), a student at Palestine Technical University “Khadouri” in Tulkarm, and took him to an unknown destination. Around the same time, Israeli forces moved into Awarta village, east of Nablus. They raided and searched a number of houses. They then arrested Abdullah Abdul Hafiz Saleh Awwad (22), a student at al-Najah National University in Nablus. Also around the same time, Israeli forces moved into Tafouh village, west of Hebron. They raided and searched a house belonging to the family of Adham Sarhan al-Tardah (24). Moreover, they arrested the aforementioned person and took him to an unknown destination. At approximately 02:00, Israeli forces moved into Hebron. They raided and searched 2 houses belonging to the families of Sobhi Mostafa al-Qawasmah (43) in Da’erat al-Sair area and Journalist Tha’er Zeyad al-Fakhouri (26) in Khellet Hadhour. Israeli soldiers arrested the 2 aforementioned persons and took them to an unknown destination. After which, Israeli forces raided another house belonging to the family of Abdul Mohsen Shaher Hasounah (21), who was killed by Israeli forces in West Jerusalem on 14 December 2015, after carrying out a run-over attack according to the Israeli story. They withdrew in the early morning and no arrests were reported from that house. Around the same time, Israeli forces moved into Tulkarm. They raided and searched a house belonging to the family of Belal Khamis Yusef Abu Safirah (57). They then detained his son Mohammed (24)in a room and questioned him on the spot. Half an hour later, Israeli soldiers confiscated 3 laptops and took Mohammed to a bookshop belonging to his father in the centre of the city. They broke the locks of the bookshop and then called one of workers there to open it. Israeli forces then confiscated the DVR and a PC from the bookshop. They arrested Ahmed Jehad Abdul Khaleq Shaltaf (21) and withdrew later. At approximately 02:30, Israeli forces moved into Jenin refugee camp. They raided and searched a house belonging to the family of Ramzi Tawfiq Jom’ah al-Hendi (21). Moreover, they arrested the aforementioned person and took him to an unknown destination. At approximately 03:00, Israeli forces moved into Tal village, southwest of Nablus. They raided and searched a number of houses. They then arrested Mahmoud Mostafa Asidah (22), a student at al-Najah National University in Nablus. Around the same time, Israeli forces moved into Bani Na’im village, east of Hebron. They raided and searched a house belonging to the family of Yusef Khader al-Birawi (26). Moreover, they arrested the aforementioned person and took him to an unknown destination. Around the same time, Israeli forces moved into Deir Samet village, southwest of Doura, southwest of Hebron. They raided and searched a house belonging to the family of Essa Ibrahim Salamah Hroub (56), who was killed by Israeli forces on 11 December 2015 at a military checkpoint at the entrance to Sa’ir village, under the pretext of a run-over attack. They obliged the family to stay outdoors and took photos and measures of the house. At approximately 11:10, Israeli forces stationed at the border fence between the Gaza Strip and Israel, east of al-Fokhari area, east of Khan Yunis, south of the Gaza Strip, opened fire at the border area. As a result, Yusef Mohammed Abu Aqel (20) was hit with a bullet that penetrated the belly and entered the hand. The aforementioned person was grazing his sheep near a landfill that is about 150 meters away from the border fence. The wounded person was taken to Gaza European Hospital. His wound was classified as moderate. Moreover, 3 sheep died. In the afternoon, medical sources pronounced Samah Abed al-Mo’men Ahmed Abdullah (18), from Amoriyah village, southeast of Nablus, dead of injuries she sustained earlier. According to PCHR’s investigations then, at approximately 14:45, on Monday, 23 November 2015, Israeli forces shot dead Alaa Khalil Hashash (16), from new Askar refugee camp, northeast of Nablus. The gunfire resulted also in wounding Samah Abed al-Mo’men Ahmed Abdullah (18) to the head, while sitting in her father’s car as they were going home from Nablus. At approximately 20:50, the aforementioned girl was transported to Tel HaShomer Hospital in Israel until she was pronounced dead. Mohammed Sulaiman Ibrahim al-Najjar (28). He sustained shrapnel wounds to the lower limbs. Due to random gunfire, Saber Barakah (57) sustained a bullet wound to the leg while he was present in Abu T’aimah neighbourhood in Abasan village, east of Khan Yunis, few meters away from the border fence. Note: During the aforementioned day, Israeli forces carried out4incursions in the following areas without reporting any arrests: al-Zawyah village, west of Salfit; Doura, al-Hadab village and Beit Omrah village in Hebron. At approximately 11:30 on Thursday, 10 December 2015, dozens of Palestinian young men gathered in “Natanya” Street near Gishori factories, west of Tulkarem. Once the protesters approached, Israeli forces moved into the area and the western lands of the Palestine Technical University “Khadouri” and started firing tear gas canisters at the protesters, who threw stones and Molotov cocktails in response. Israeli soldiers then fired live ammunition and rubber-coated metal bullets against the protestors, due to which, 9 civilians, including 3 children, were hit with live bullets to the lower limbs. Following the Friday prayer, 11 December 2015, Hamas movement organized a peaceful demonstration on the anniversary of its establishment. The demonstration started from al-Haras mosque in Hebron, and then headed toRas al-Joura area at the northern entrance of Hebron. When the protesters made their way towards the Israeli military watchtower established on the road leading to the southern side of Halhoul City, Israeli military vehicles arrived and a number of soldiers deployed in the area. When the protesters approached, Israeli soldiers heavily fired tear gas canisters from a launcher fixed on a military jeep. The protesters stepped back towards Ras al-Joura square, while the Israeli soldiers fired tear gas canisters and chased them. As a result, the protesters threw stones at the Israeli soldiers stationed behind the Palestinian vehicles on the side of the road, who fired rubber-coated metal bullets in response.In the meantime, many military jeeps made their way from the southern entrance of Halhoul village to al-Kamb area, where dozens of young men set fire to rubber tires and closed the road with piles of rocks. Due to which, clashes erupted between the protesters and the soldiers, who fired rubber-coated metal bullets and tear gas canisters at the protests. At approximately 13:30, an Israeli Border Guard patrol arrived and opened fire at the protesters. As a result, 8 civilians were wounded, including journalist Mohammed ‘Arif al-Shourbati (25), who works for local news agencies. ‘Arif was hit with Two-Two bullets. Additionally, ‘Oday Jihad Irshaid (24) from al-Salam Street neighborhood, was hit with 2 live bullets to the chest and neck. The wounded persons were taken by PRCS ambulances to the village hospitals. Irshaid was admitted to the emergency room at al-Ahli hospital. Soon after he was pronounced dead. It should be mentioned that the above-mentioned victim is the brother of Dania Irshaid (16), who was killed by Israeli soldiers at the al-Ibrahimi mosque entrance on 25 October 2015, claiming that she carried out a stabbing. Raghda Nidal Nour al-Deen Etma, a reporter at Palestine al-Yawm TV. She was hit with a rubber-coated metal bullet to his left leg. Following the Friday prayer, a number of Palestinian young men gathered in the center of Beit Furik village, southeast of Nablus, and then made their way to al-Qneitra Mountain near “Itamar” settlement. When the protesters approached the area, the Israeli soldiers heavily fired tear gas canisters at the protesters, who threw stones in response. Israeli soldiers then fired live bullets and rubber-coated metal bullets at the protestors, due to which, a 28-year-old civilian was hit with a rubber-coated metal bullet to his right hand. Around the same time, dozens of Palestinian young men gathered in the center of Aboud village, northwest of Ramallah and al-Bireh, to organize a demonstration demanding the Israeli forces to open the main entrance of ‘Aboud village which has been closed with sand barriers about a week ago. The protesters made their way to the village streets and then headed to the above-mentioned village. The Israeli soldiers stationed at a military watchtower established at the entrance of the village, fired rubber coated-metal bullets, live ammunition, sound bombs and tear gas canisters at the protesters in response. As a result, 2 civilians were wounded. An 18-year-old male sustained a live bullet wound to his left leg, while 21 year-old male sustained a live bullet wound to his right knee. The wounded persons were then taken to Palestine Medical Complex in Ramallah to receive medical treatment. On Friday afternoon, dozens of Palestinian civilians gathered in the vicinity of Ofer prison, west of Ramallah, to organize a demonstration against the Israeli policy. After which, the protesters made their way to the prison gate, so the Israeli forces closed the gate and deployed in the area. The protesters set fire to rubber tires and threw stones and empty bottles at the Israeli soldiers, who immediately fired live ammunition, rubber-coated metal bullets, sound bombs and tear gas canisters at the protesters. As a result, 2 civilians were wounded; a 25-year-old civilian was hit with live bullet to his left and a 25-year-old civilian was hit with a rubber-coated metal bullet to his right hand, due to which he sustained fractures. On Saturday afternoon, 12 December 2015, dozens of Palestinian young men gathered near al-Huda Petrol Station in al-Balou’ neighborhood at the northern entrance of al-Bireh. They then headed to the (DCO) checkpoint and “Beit Eill” settlement. The protesters set fire to tires and threw stones and Molotov cocktails at Israeli soldiers, who immediately fired live ammunition, rubber-coated metal bullets, sound bombs and tear gas canisters at the protesters. As a result, 4 civilians were wounded and then taken to Palestine Complex Medical to receive medical treatment. On Monday, 14 December 2015, dozens of young men gathered at the southern entrance of al-Jalzoun refugee camp, north of Ramallah, near an UNRWA school for boys, which is around 300 meters away from “Beit Eill” settlement fence. The protesters gathered to organize a demonstration in protest at the Israeli attacks in the oPt. They then threw stones at the settlement’s fence. Due to which, the soldiers stationed along the border fence fired live ammunition, rubber-coated metal bullets, tear gas canisters and sound bombs at the protesters and chased them into the camp. As a result, a number of civilians suffered tear gas inhalation. Additionally, the Israeli soldiers attacked a vehicle belonging to Sufian Imad Hassan Kahla (23), from Ramoun village, east of Ramallah. Sufian was intentionally hit with a rubber-coated metal bullet while he was trying to reverse after the Israeli soldiers prevented the vehicles from passing. As a result, the vehicle’s rear window was smashed and the glass scattered around. As a result, some pieces got into his right eye. Sufian went to a medical clinic in the refugee camp and was then taken to Musallam Specialty Hospital in Ramallah to receive medical treatment. He underwent an operation for one hour. At approximately 13:00 on Friday, 04 December 2015, dozens of Palestinian young men headed to the border fence between the Gaza Strip and Israel, east of al-Shuja’ia neighborhood, east of the Gaza Strip. A number of protesters approached the fence, set fire to rubber tires and threw stones at the Israeli forces stationed along the fence. Due to which, the Israeli forces sporadically fired live ammunition and tear gas canisters at the protesters. As a result, 3 civilians were hit with live bullets. At approximately 13:30 on Friday, dozens of youngsters headed to the border fence between the Gaza Strip and Israel, east of al-Farahin area, east of Khan Younis, south of the Gaza Strip. A number of protesters approached the border fence, set fire to rubber tire, raised the Palestinian flags and threw stones at the soldiers stationed along the fence. Due to which, Israeli soldiers sporadically fired live ammunition and tear gas canisters at the protesters until the evening. As a result, 3 civilians, including a child, were wounded with live bullets and were then taken to the Gaza European Hospital to receive medical treatment. At approximately 14:30 on Friday, hundreds of Palestinian young men headed to the border fence between the Gaza Strip and Israel, east of al-Bureij refugee camp in the center of the Gaza Strip. The protesters set fire to rubber tires and threw stones at the soldiers stationed behind the sand barriers along the fence. Due to which, Israeli soldiers opened fire at the protesters. As a result, 17 civilians, including 2 children and a journalist, were wounded. The wounded persons were taken to the al-Aqsa hospital in Deir al-Balah, where medical sources announced the death of Sami Shawqi Ahmed Madi (41), who was hit with a live bullet to the chest. After which, the PFLP mourned Madi, who is a PFLP member in Deir al-Balah. It should be mentioned that the PFLP called its members and supporters to participate in the aforementioned protest to commemorate the 48th anniversary of its establishment and in solidarity with the Palestinians in the West Bank. The wounded journalist, Mahmoud ‘Omar Mahmoud al-Louh (25), who works as a reporter at al-Sha’b radio, was hit with a live bullet to the right leg. Around the same time, Israeli forces stationed at Beit Hanoun Crossing, northwestern of Beit Hanoun, north of the Gaza Strip, fired live ammunition, rubber-coated metal bullets and tear gas canisters at dozens of young men, who were on the road between the Palestinian and the Israeli sides of the crossing. The protesters threw stones at the soldiers in protest at the Israeli attacks against the Palestinian civilians in Jerusalem and the West Bank. As a result of the clashes, which continued until 17:30, 12 civilians, including 2 children, were wounded. Eight of whom were hit with live bullets, one was hit with a rubber-coated metal bullet while 3 others were directly hit with tear gas canister. At approximately 00:00 on Friday, 05 December 2015, Palestinian civilians and international human rights defenders organized a protest from the center of Kufor Qaddoum village, northeast of Qalqilya, and made their way to the eastern entrance to the village in protest against closing that entrance since the beginning of al-Aqsa Intifada with an iron gate. When they arrived at the gate, Israeli forces fired live ammunition, rubber-coated metal bullets, sound bombs and tear gas canisters at the protesters. As a result, 4 civilians, including a child, were wounded. Three of whom were hit with live bullets to the lower limbs of their bodies while a 13-year-old child was hit with 3 rubber-coated metal bullets to his right leg. Following the Friday prayer, Palestinians from Bil’in village and Israeli and international human rights defenders organized the weekly peaceful demonstration in protest against the annexation wall and settlement activities. The demonstrators made their way through the village streets and then headed to the annexation wall. The demonstrators walked along the cement wall and tried to sneak through the fence. The Israeli force stationed behind the wall from the western side fired live ammunition, rubber-coated metal bullets, sound bombs and tear gas canisters at the protesters. They also chased them into olive fields and between the houses in response. As a result, 2 civilians were wounded, a 27-year-old was hit with a sponge-tipped bullet to his right hand and a 34-year-old was hit with a rubber-coated metal bullet to his left leg. On the same day, Palestinians from al-Nabi Saleh village and Israeli and international human rights defenders gathered in the center of the Martyrs Square in the abovementioned village, northwest of Ramallah, in protest against the annexation wall and settlement activities. The protesters made their way through the village streets raising Palestinian flags and chanting national slogans against the Israeli occupation. They then headed to the lands threatened to be confiscated by Israeli settlers near “Halamish” settlement. The Israeli forces had closed all the entrances to the village to prevent demonstrators from participating in the demonstration. When the protesters arrived at the abovementioned lands, Israeli forces fired live ammunition, rubber-coated metal bullets, sound bombs and tear gas canisters at the protesters. As a result, Bilal Abdel-Salam Tamimi (49), a photojournalist at the public committee against the annexation wall and the settlement activities in al-Nabi Saleh village, was hit with a rubber-coated metal bullet to his left knee, while Najla Osama (20) was hit with a rubber-coated metal bullet to his right hand. At approximately 15:00 on Saturday, 12 December 2015, Palestinian civilians and international human rights defenders started a protest from the center of Kufor Qaddoum village, northeast of Qalqilya, and made their way to the eastern entrance to the village in protest against closing that entrance since the beginning of al-Aqsa Intifada with an iron gate. When they arrived at the gate, Israeli forces fired live ammunition at the protesters. As a result, a 17-year-old child was hit with a live bullet to his left thigh. Following the Friday prayer, Palestinians from Ni’lin village organized a protest against the annexation wall, settlement activities and Israeli policies in the following villages and areas: Ni’lin village, west of Ramallah, al-Tawel Mountain, east of al-Bireh, al-Jazloun refugee camp and Turmusaya village. On Tuesday, 08 December 2015, Israeli forces allowed the exportation of 8.7 tons potatoes; 7.5 tons of eggplants; 5.7 tons of cucumber; 3.8 tons of palms; 1.5 tons of squash; 10 tons of pepper; 2.7 tons of cabbage; 92 tons of tomatoes; 2.7 tons of cherry tomatoes and 0.6 tons of cauliflower. On Wednesday, 09 December 2015, Israeli forces allowed the exportation of 160 tons of scrapand 1.05 tons of strawberries. On Thursday, 10 December 2015, Israeli forces allowed the exportation of 18.5 tons of eggplants; 12 tons of cucumber; 5.8 tons of palms; 5.5 tons of pepper; 4.5 tons of cabbages; 15 tons of sweet peppers; 15 tons of tomatoes; 0.8 tons of cherry tomatoes;0.35 tons of garlic; 0.32 tons of mints and 10 tons of sweet potatoes. On Sunday, 13 December 2015, Israeli forces allowed the exportation of 15.5 tons of eggplants; 32 tons of cucumbers; 6.2 tons of palms; 3.3 tons of squash; 5.5 tons of peppers; 8.6 tons of cabbages; 12 tons of sweet peppers; 2 tons of tomatoes; 11 tons of sweet potatoes; 6.62 tons of strawberries; 9 tons of cloths and 44 tons of stationery. On Monday, 14 December 2015, Israeli forces allowed the exportation of 160 tons scrap. On Tuesday, 15 December 2015, Israeli forces allowed the exportation of 2 truckloads of eggplants; 10 truckloads of vegetables and 4 truckloads of strawberries. On Friday, 11 December 2015, Israeli authorities allowed 181 civilians from the Gaza Strip to perform prayers in al-Aqsa Mosque in Occupied Jerusalem. On Tuesday, 15 December 2015, Israeli authorities allowed 62 civilians from the Gaza Strip to perform prayers in al-Aqsa Mosque in Occupied Jerusalem. On Thursday, 10 December 2015, Israeli authorities allowed 1 person working in an international organization or to renew his permit. On Monday, 14 December 2015, Israeli authorities allowed 1 person working in an international organization or to renew his permit. At approximately 08:00 on Sunday, 13 December 2015, Israeli forces stationed at Beit Hanoun Crossing in the northern Gaza Strip arrested Mohammed Ref’at Mohammed Abu Jummiza (27), when he was on his way along with a PRCS crew traveling to attend a training course in Israel. The PRCS crew was allowed to enter while Mohammed was detained for many hours. Mohammed’s father said to a PCHR fieldworker that one of Mohammed’s friends had called him and told him that Mohammed, who works as an x-ray technician at al-Quds hospital, was arrested. After which, he was taken to al-Majdal prison. It should be noted that Mohammed is still in the Israeli jail so far. Hebron:Israeli forces established (70) checkpoints all over the city. On Thursday, 10 December 2015, the Israeli forces established 11 checkpoints at the entrances of Ethna village; Bani Na’im village; Beit Ummer village; Sa’ir village; al-‘Aroub and al-Fawar refugee camps; the southern and northern entrances of Hebron; the southern and northern entrances of Halhoul village and on the road between Dura village and its southern villages. On Friday, 11 December 2015, Israeli forces established 8 checkpoints at the entrances of Ethna village; Beit Ummer village; Sa’ir village; al-‘Aroub and al-Fawar refugee camps; the southern and northern entrances of Hebron and the northern entrance of Halhoul. On Saturday, 12 December 2015, Israeli forces established 10 checkpoints at the entrances of Ethna village; Samou’a village; Beit Ummer village; Sa’ir village; Beit Ummer village; al-‘Aroub and al-Fawar refugee camps; the southern and northern entrances of Hebron and the southern and northern entrances of Halhoul village. On Sunday, 13 December 2015, Israeli forces established 11 checkpoints at entrances of Ethna village; Beit Ummer village; Sa’ir village; Bani Na’eim village; al-‘Aroub and al-Fawar refugee camps; the southern and northern entrances of Hebron ; the northern and southern entrances of Halhoul and the eastern entrance of Dura. On Monday, 14 December 2015 and on Tuesday, 15 December 2015, the Israeli forces established the same checkpoints again in the abovementioned villages. On Wednesday, 16 December 2015, Israeli forces established 8 checkpoints at the entrances of Bani Na’im village; Beit Ummer village; Sa’ir village; al-‘Aroub and al-Fawar refugee camps; the northern and southern entrances of Hebron and the northern entrance of Halhoul village. Ramallah and al-Bireh:Israeli forces established (18) checkpoints all over the cityof Ramallah. On Thursday, 10 December 2015, Israeli forces established 4 checkpoints at the entrances of the western Laban village; Rantis village, northwest of Ramallah; the intersection of Beit Our al-Foqa village, southwest of Ramallah and ‘Atara bridge at the northern entrance of Birzeit, north of Ramallah. On Friday, 11 December 2015, Israeli forces established 4 checkpoints at the entrances of al-Nabi Saleh village; Dir Abu Mesh’al village, northwest of Ramallah; Senjil village, north of Ramallah and under the bridge of Yabroud village, northeast of Ramallah. At approximately 18:30, Israeli forces closed the main entrance of ‘Abod village, northwest of Ramallah with sand barriers. On Saturday, 12 December 2015, Israeli forces established 2 checkpoints at the south-western entrance of al-Moughyer village, northeast of Ramallah and the eastern entrance of al-Tiba village, northeast of Ramallah. At approximately 13:00, Israeli forces closed the eastern entrance of al-Nabi Saleh village, northeast of Ramallah, with an iron gate established on the abovementioned entrance. At approximately 10:30 on Sunday, 13 December 2015, Israeli forces established a checkpoint at the entrance of al-Nabi Saleh village, northwest of Ramallah. At approximately 12:30, Israeli forces established a checkpoint at the eastern entrance of Termas’ia village, north of Ramallah. On Monday, 14 December 2015, Israeli forces established 3 checkpoints at the entrances of Senjil village, north of Ramallah; Dir Abu Mish’al village, northwest of Ramallah and under the bridge of Yabroud village, northeast of Ramallah. Additionally, Israeli soldiers stationed at the bridge of Yabroud village searched the Palestinian vehicles; checked the Passengers’ IDs and then detained a number of civilians. According to Jihad Khaled Hamed (32), Jihad was sitting in his vehicle along with his colleagues when the Israeli soldiers forced them to get out of the vehicle, as they were going back from their work to Selwad village. The soldiers obliged them to squat for 20 minutes. During which, the soldiers stole some tools from inside the vehicle estimated at NIS 3500. When Jihad asked the soldiers to return their tools, one of the soldiers pointed ascalpel at him. Due to which, Jihad along with his colleagues left the place. On Tuesday, 15 December 2015, the Israeli soldiers closed the eastern entrance of the western Laban village, northwest of Ramallah, with cement cubes. Additionally, the soldiers established an iron gate at the entrance. On Tuesday, 15 December 2015, Israeli forces established 4 checkpoints at the entrances of Senjil village, north of Ramallah; Deir Qedees village, west of Ramallah; the north-eastern entrance of Kherbitha Bani Harith village, northwest of Ramallah and near the bridge of Yabroud village, northeast of Ramallah. Jericho:At approximately 09:30 on Friday, 11 December 2015, Israeli forces established a checkpoint near the entrance of Fasayel village, north of Jericho. At approximately 20:00, Israeli forces established a checkpoint at the entrance of al-Zabaidat village, north of Jericho. Qalqilia: At approximately 17:10 on Friday, 11 December 2015, Israeli forces established a checkpoint at the entrance of Eizbit al-Tabib village, east of Qalqilia. On Sunday, 13 December 2015, Israeli forces established 3 checkpoints at the intersections of ‘Azoun village; Jinsafout village and on the main street between Nablus and Qalqilia. Salfit:On Thursday, 10 December 2015, Israeli forces established a checkpoint at the western entrance of Kufor al-Deik village, west of Salfit. Tulkarm: At approximately 15:30 on Friday, 11 December 2015, Israeli forces established a checkpoint on the main road between Tulkarm and Nablus near the intersection of Beit Leed village, east of Tulkarm. At approximately 17:30, Israeli forces established a checkpoint on the main road between Tulkarm and other villages in the north of Tulkarm near the entrance of al-Jaroshyia village, north of Tulkarm. At approximately 10:00 on Thursday, 10 December 2015, the Israeli Border Guards stationed at the checkpoint established in the south of al-Ibrahimi mosque arrested Ahmed Ali Abed Taha Abu Sanina (16), claiming that he did not listen to the soldiers orders. At approximately 18:00 on Sunday, 13 December 2015, Israeli forces established a checkpoint at the eastern entrance of Qalqilia. The soldiers checked the passengers’ IDs and searched their vehicles. After which, they arrested Omar Shaher al-Sidaa (23) from Jeet village and took him to an unknown destination. On Tuesday, 15 December 2015, an Israeli infantry unit comprised of around 4 soldiers established a checkpoint under the Bypass road (60) leading to the western entrance of Selwad village, northeast of Ramallah. The soldiers searched the vehicles, checked the passengers’ IDs and then arrested many civilians from Selwad village while returning from their work. After which, the soldiers opened fire at the arrested civilians, beat and kicked them and then hit them with gun butts throughout their bodies. Among the wounded persons 4 brothers were identified as Ya’qoub Bassem Hamed (33); Ibrahim (30); Mostafa (24) and Mahmoud (20), who were arrested and then taken to Benjamin police station, southeast of Ramallah. Moreover, Israeli forces handcuffed and beat Omar Bassem Hamad (24). They also opened fire around a vehicle belonging to Naseem Salah Abu Tharia (38) and then beat him and detained him for 4 hours. At approximately 16:00, Israeli forces deployed near the security fence in the western area of al-Koum village, southwest of Dura, southwest of Hebron, arrested Abed al-Nasir Abed al-Jalil Mohammed al-Haroub (45) and Khadir Ahmed Salama al-Haroub (43) when they were around the security fence. They were then taken by a military jeep to an unknown destination. In two separate incidents, on Wednesday 16 December 2015, Israeli forces killed two Palestinian civilians during a predawn military incursion into Qalandia refugee camp, north of Jerusalem, under the pretext of carrying out two run over attacks against Israeli soldiers, who raided and searched shops and houses. According to PCHR’s investigations about the first crime, at approximately 00:30, Israeli soldiers opened fire at a silver Mitsubishi car on the Jerusalem-Ramallah Main Road directly in front of Qalandia camp. An eyewitness said to a PCHR fieldworker that he heard a car colliding with something and then sound of heavy shooting. When he went out of the shop he works in, he saw dozens of Israeli soldiers deployed on the main street. The soldiers took him out of the car and put him on the ground, but he was still moving. When the soldiers saw the eyewitness, they ordered him to leave the area. During which, he heard a hail of bullets indicating that the soldiers killed the wounded person. The eyewitness added that he ascended to the shop roof and saw the wounded person’s head under the car. He did not see any soldiers on the ground, but an Israeli military ambulance transferring the corpse of the Palestinian young man. The killed person was later identified as Ahmed Jahashhah (23) from Qalandia. According to PCHR’s investigations about the second crime, at approximately 01:30, Israeli soldiers backed by military vehicles move into Qalandia refugee camp, north of Occupied Jerusalem. They raided and searched a number of houses to carry out an arrest campaign. When they were in al-Yasmin neighbourhood, northwest of the camp, the reisdents heard shooting and a crash. An eyewitness said to a PCHR fieldworker that while he was watching the soldiers, he saw a white Hyundai Accent car entering the neighbourhood. The soldiers stopped it, but the driver continued. The soldiers then opened fire at the car. The eyewitness added that he saw the soldiers putting the car driver’s corpse in a sack and leaving the area one hour later. He knew later that the car driver is from al-Bireh and identified as Hekmat Farouq Hemkat Hamdan (33). At approximately 03:00 on Thursday, 10 December 2015, Israeli forces raided and searched a house belonging to the family of Harion Burqan in al-Thawri neighbourhood, south of East Jerusalem’s Old City. They arrested his son, Ashraf (18) and took him to an unknown destination. At approximately 14:00 on the same day, Israeli forces arrested four Palestinian children after beating them when they were out of their schools in al-Tour neighbourhood, east of Occupied Jerusalem. The arrested children were identified as Amir Sami Muhie al-Deen Abu al-Hawa (15); Khader Wael Khader Abu Ghannam (15); Haitham Nasim Hasan Khweis (13) and ‘Ali Taha (15). At approximately 19:00, Israeli forces arrested Mohammed Riyadh al-‘Ajlouni (12) and his brother ‘Alaa’ (14) while walking in al-Wad Street in East Jerusalem’s Old City. They were then taken to an unknown destination. At approximately 05:00 on Saturday, 12 December 2015, Israeli forces moved into ‘Ain al-Lawzah in Selwan village, south of East Jerusalem’s Old City. They raided and searched a number of houses. They arrested Amir Mahmoud al-Mohtaseb (15) and Ahmed Naser Abu Khalaf (16) and took them to an unknown destination. At approximately 04:00 on Monday, 14 December 2015, Israeli forces moved into Jabal al-Mukaber village, southeast of East Jerusalem. They raided and searched a number of houses. They then arrested Mohammed Yousif Khalaylah (21) and Mohammed ‘Aziz ‘Abdah (19) and took them to an unknown destination. At approximately 04:30 on the same day, Israeli forces moved into Hattah Gate neighbourhood in East Jerusalem’s Old City. They raided and searched a number of houses. They arrested Tamer Amjad Basti (15); Mohammed Ra’ed Abu Sneinah (15) and Mahmoud Khaled Salim (14) and took them to an unknown destination. At approximately 13:00, Israeli forces arrested Rami Abu Khalifah (23) when he was crossing Sho’afat checkpoint, north of East Jerusalem’s Old City, and took him to an unknown destination. On Tuesday, 15 December 2015, Israeli authorities summoned a Palestinian woman and 3 young men to al-Maskoubiah police station in West Jerusalem and handed them “deportation” and “travel ban” orders. According to PCHR’s investigations, the Israeli authorities issued two deportation orders against 18-year old Jerusalemite prisoner Obada Najib and 24-year old Jerusalemite prisoner Mohammad Abdel Baset Mufalfel (Razem). The orders were signed by the Commander of Internal Region “Yoyel Satrik” according to Articles 6, 108 and 109 under the 1945 Defence (Emergency)Regulations and to protect the State Security, public order and community safety. Maps were attached to the orders showing the areas where they are not allowed to be. It should be mentioned that Mufalfel is a former prisoner from Silwan. He is married and has an 11-month baby. He was previously arrested twice; in 2010 for one week and was under house-arrest for 21 months, and in 2012 for 6 months. He was also denied four times accessinto al-Aqsa Mosque; the last of which was last week. Travel-ban orders were issued against Hanadi Halawani and Akram Shurafa. They were handed the orders after summoning them for investigation. The orders were issued following an order from the Deputy Prime Minister and Minister of Interior according to article 6 of the 1948 State Emergency Law. The Israeli authorities claimed in their order that Halawani and Shurafa have a relationship with Hamas activists, so travelling abroad could support activities with security concerns and might pose threat to the State Security.It is noteworthy that Shurafa had a previous travel-ban order that was over on 30/11/2015 and was renewed on the aforementioned Tuesday. The Israeli authorities also have banned Shurafa from entering Al-Aqsa Mosque for two years. At approximately 15:00, israei forces arrested Yehia Nader Diab (10) when he was walking near al-Saherah Gate in the Old City of East Jerusalem. He was then taken to Salah al-Din Street police station to question him. At approximately 16:00 on the same day, Israeli forces arrested Zuhairah Abu ‘Eishah (27) from Kafr ‘Aqab village when she was in East Jerusalem’s Old City under the pretext of attempting to carry out a stab attack in Jerusalem. The Israeli “0404” website related to the Israeli Forces claimed that Israeli border guard agents arrested a young woman in Jerusalem as she had a sharp tool “screw” and intended to carry out a stab attack. The Israeli police claimed that the young woman admitted during the preliminary investigations about her intention to do so. At approximately 19:00, Israeli forces raided and searched a house belonging to Mahmoud Idkeik in Ras al-‘Amoud neighbourhood, east of East Jerusalem’s Old City. They arrested his son Mohammed (17) and took him to an unknown destination. At approximately 20:00, Israeli forces moved into “Hosh Najib” area in the Old City of East Jerusalem. They raided and searched a number of houses, which Mohammed Murad Najib (16) and Mos’ab Najib (14) were arrested. They were then taken to an unknown destination. At approximately 21:00 on Tuesday, 15 December 2015, Israeli forces raided and searched a house belonging to Leila Mustafa in Jabal al-Mukaber village, southeast of East Jerusalem. They arrested her on suspicions of carrying out an attack and was taken to an unknown destination. On Sunday morning, 13 December 2015, the Israeli Collection Department issued a notice to evacuate two residential buildings in “Batn al-Hawa” neighbourhood in Silwan village, south of East Jerusalem after the settlement organization “’Ateerat Cohanim” obtained it under the pretext of “settlers’ ownership of the land”. According to PCHR’s investigation, the Israeli authorities handed an evacuation order to Yousef Basbous and his sons that was issued by the Israeli Collection Department in favour of the settlement organization “Ateerat Cohanim” claiming that the land is owned by settlers since the year 1881; they also imposed large sums of money on the family as “compensation for lawyers”. Raed Basbous, Yousef’s son, explained that the evacuation order was issued on the name of his father and eight brothers (males and females) and gave them 20 days to execute the order.The Israeli authorities issued the evacuation order in absentia last July under the pretext that Basbous family did not file any appeal to the lawsuits filed by Ateerat Cohanim against them.The family confirmed not receiving any notices from Ateerat Cohanim and was surprised by the evacuation order in favor of settlers. It should be noted that the family has been living in the building, which is comprised of 3 apartments,fordecades. Ra’fat and his family of 6 members; Ra’ed and his family of 6 members and Mohammed and his wife live in this building. The settlement organization also handed the sons of later Jaber Abdel Fatah Rajabi judicial notices asking for their land in the Batn Al-Hawa neighborhood in Silwan where their residential building is established under the pretext of “ownership by settlers”. Zuheir Rajabi, head of Batn Al-Hawa committee, explained that the family received judicial notices under the name of “sons of later Jaber Rajabi” (15 brothers and sisters) asking them for their land where their building is established; note that every floor has one apartment and three families of 15 individuals live in the building. At approximately 11:00 on Tuesday, 15 December 2015, joint staffs from the Israeli Municipality and forces raided a building belonging to the family of Khail ‘Alian in Jabal al-Mukkaber village, southeast of East Jerusalem, and handed the family an administrative demolition under the pretext of building without a license. ‘Alian family said that the building belonging to Khalil ‘Alian and his sons is comprised of 3 floors; in each of which there is a 130-square-meter apartment. The building shelters 25 members. It should be mentioned that the family of Bahaa’ ‘Alian lives in the second floor built in 2003 and has tried for years to obtain a license from the competent authorities noting that the orders to demolish the building was suspended by the Municipality court. It should be mentioned that Bahaa’ ‘Alian was killed on 13 October 2015 when he carried out a stab and shooting attack in an Israeli bus in Jabal al-Mukkber village. At approximately 09:00 on Wednesday, 16 December 2015, Israeli musicality bulldozers demolished a house belonging to Ibrahim Diab in al-sheikh Jarrah neighborhood, north of East Jerusalem’s old City under the pretext of building without a license. Daughter of the house owner, Dina Diab, said that joint staffs from the Israeli municipality and police moved into al-Sheikh Jarrah neighborhood and surrounded the house. They forcibly took them out of the house and did not allow them to take their furniture or personal belongings. The house used to shelter a family of 7 members, including 5 children and was build years ago. The family rebuilt parts of the 85-square-meter house, which is comprised of two rooms, a kitchen and bathroom. On Saturday morning, 12 December 2015, activists from Peace Now organization revealed that the Israeli Civil Administration issued a military order, which declared about 30 dunums of Palestinian lands in Deiristiya village in Salfit and Jinsafut village in Qalqiliya, as “State Land”. The dunums to be confiscated are located between the settlements of “Karne Shamron” and “Ma’ale Shamron” established on the lands of the aforementioned villages. The order included areas 18 and 19 known as al-Manazel and Sahlat T’eimah from Deiristiya village; areas 5 and 7 known as Jabal al-Sarih and Ras Bashir in Jinsafut village. According to the order, the Palestinian landowners can submit their petitions against the aforementioned order within 45 days if they have any right to own lands in the above-mentioned areas. The landowners were identified as Hasan Mohammed Hasan ‘Assaf; Hazim Mohammed Ibrahim Salim; Monther Ahmed Khalil Redwan; Jalal ‘Abdel Rahim Mohammed Bashir; Qasem Yousif Bashir; Mahmoud ‘Abdel Qader Mahmoud Samhan and Khaled Mohammed Abu Hajlah. At approximately 14:00 on Thursday, 10 December 2015, a group of settlers under the Israeli forces’ protection backed by military vehicles moved into “al-Hafirah” area between ‘Arabah and Markah villages, southwest of Jenin. They performed religious rituals near an archaeological site. Meanwhile, Israeli forces raided and searched a house belonging to Samer Mohammed Ahmed Mousa (46) and turned it into a military observation point. At approximately 17:00, the settlers and Israeli forces withdrew, but no further incidents were reported. It should be mentioned that this area is being raided from time to time for Talmudic prayers. At approximately 23:00 on Sunday, 13 December 2015, a group of settlers moved into the area of “Tarsalah settlement”, which was evacuated in 2005, and also known as “Sanour Camp” established on Palestinian lands, south of Jenin. A local source said to a PCHR’s fieldworker that the settlers set their tents and stayed for some tme in the area to perform Talmudic prayers. The settlers later withdrew as Israeli soldiers arrived at the area. No further incidents were reported. One dunum equals 1000 square meters.